MAYOR BLOOMBERG’S SISTER SOULJAH MOMENT? Former New York Mayor Michael Bloomberg is a liberal. He espouses strong left-wing positions on gun control, abortion, immigration, and climate change. He proposed banning the sale of many sweetened beverages over 16 ounces. He endorsed Obama in 2008. Last week, Bloomberg traveled to Harvard University, the bastion of American liberalism, and delivered a stinging criticism of liberals. After the obligatory attempts at joking up the student audience (“I’m excited to be … in the exact spot where Oprah stood last year. OMG.” “Don’t you just hate it when alumni put their names all over everything? I was thinking about that this morning as I walked into the Bloomberg Center.”), Bloomberg turned to the subject of freedom of speech. He began with exaltations of separation between church and state, and references to the McCarthy Scare of the 50s, familiar tropes in any liberal address. “Repressing free expression is a natural human weakness,” he told the students and faculty, “and it is up to us to fight it at every turn.” Bloomberg did not say whom he included in “us,” but most attendees probably thought they knew. Surely “us” referred to liberals – the enlightened ones who have been campaigning against dead Senator McCarthy for 65 years. But the Mayor threw them a curve ball. Then, dispensing with any pretense at neutrality, the Mayor launched into a powerful assault on the ideological wing responsible for this modern censorship: liberals. “Think about the irony,” he noted. “In the 1950s, the right wing was attempting to repress left wing ideas. Today, on many college campuses, it is liberals trying to repress conservative ideas, even as conservative faculty members are at risk of becoming an endangered species”. Bloomberg might have noted that the 96 percent figure understates the problem at some colleges. For example, at Princeton, according to an analysis by the university newspaper, only one faculty member and a janitor donated to the campaign of Mitt Romney. Every other faculty and employee donor supported Obama. And at Bowdoin, a top liberal arts institution, 100% of the donations went to Obama. Bloomberg identified one consequence of this ideological conformity: depriving students of the opportunity to hear diverse views. This spring, it has been disturbing to see a number of college commencement speakers withdraw – or have their invitations rescinded – after protests from students and – to me, shockingly – from senior faculty and administrators who should know better. It happened at Brandeis, Haverford, Rutgers, and Smith. Last year, it happened at Swarthmore and Johns Hopkins [the Mayor’s alma mater], I’m sorry to say. Candidate Clinton, anxious to appeal to moderates and blue collar voters, seized the opportunity, and told his audience: “If you took the words ‘white’ and ‘black,’ and you reversed them, you might think David Duke was giving that speech.” Clinton was criticized by Jackson and other members of the left wing of the Democratic party for his attack on Sister Souljah, but the criticism had been expected and was no doubt welcomed by his campaign. It allowed candidate Clinton to appear tough and pragmatic at the same time, two qualities that American voters prize in their presidents. 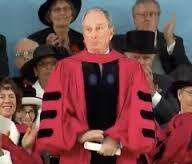 Was the 2014 Harvard Commencement address Michael Bloomberg’s Sister Souljah moment? Despite criticism of the former Mayor from the Left for his “stop-and-frisk” policies, Bloomberg is generally known outside of New York as a Left-wing politician. His efforts to nationalize the gun control debate, for example, have made him the bugbear of many Red State political activists. To build national appeal, the Mayor needs to shore up support on the Right. And what better way to do that than to stand up at Harvard, liberalism’s citadel, and inveigh against modern liberalism? Bloomberg is not currently in politics. But that does not mean he has retired for good. In 2008 and 2012, there were strong efforts to draft him as a candidate for national office, either as a third party candidate for President or as the Vice Presidential running mate on either of the two major party tickets. Bloomberg publicly disassociated himself from these efforts, but there is little doubt that he privately considered them. In 2008, for example, he reportedly met with Clay Mulford, a ballot-access expert and campaign manager for Ross Perot’s third party presidential campaigns. The next presidential election may actually be a better year for a third party candidate – especially a well-financed candidate worth an estimated $33 billion – than 2008 or 2012. The current Democratic presidential frontrunner is Hillary Clinton, a polarizing figure much beloved and much despised among voters. If Clinton is polarizing, the current crop of Republican candidates is anesthetizing. None have aroused strong emotions of any kind. More importantly, there is growing frustration with both major parties, and the stalemate they have engendered. Perhaps at no time in history have more voters been more willing to abandon party loyalty in favor of a politician who can work both sides of the aisle to get things done. After informing his audience that academia needed more diversity, he informed them that Washington needed less. What Washington needs, Mayor Bloomberg appeared to be saying, is a statesman who can talk and listen to people of different political persuasions; someone flexible, pragmatic, and willing to stand up to his own group’s partisans in order to forge a consensus. Hmmmm. Whomever could he have had in mind? Thanks for the thought-provoking post (and blog in general). An alternate take on the overwhelming support for Democrats among elite faculty – When nearly 100% of very smart people agree on something, could that possibly speak to the merits of that something? I agree that there is a reasonable argument to be made about the size and role of government. A healthy debate to that degree deserves to be part of a good university’s curriculum. But with a Republican party whose positions regularly reject sound science, promote Christianity in the public sphere, and glorify and enable private wealth accumulation without regards to societal costs and benefits, I’m not surprised that the smartest of the smart lean overwhelming Democratic. The stats you cite strike me as more of a reflection of the intellectual merit of each party’s platforms than an indictment of some conspiracy on the part of tenure committees.